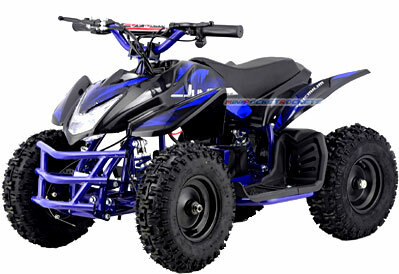 The Cobra S4 is one of the sportiest mini quads available. With an aggressively raked profile, bright center-mounted headlight, angled fenders and mud guards, the Cobra S4 is designed to get you there in style! Driven by a 350 Watt brushed motor that is powered by a 24v main battery pack, all this mini quad requires is a turn of the ignition key and you are ready to ride. Quiet yet capable, you can tackle some off-roading with its relatively massive all-terrain, air filled knobby tires. The full front and rear suspension and heavily padded seat will provide hours and miles of comfort even on brutal surfaces. The solid steel bumper will protect the rider and guard this mini quad in any situation it may run in to. And the disc brakes will stop this mini quad on a dime, dirt or asphalt. The lead-acid battery is completely sealed from the elements, as is the entire drivetrain. And unlike Li-Ion and Li-Po batteries, lead-acid batteries (the same type in automobiles) are not susceptible to risk of fire and danger. Mud and rain will not stop the Cobra S4 mini quad. The built-in speed governor allows these mini quads to be adjusted to any rider's experience level. It comes ready to ride right out of the crate. Just attach the handlebars and customize some adjustments with the included tools and you are ready to roll! Included Free with Cobra S4 Mini Quads: Charger, Keys, Fuses, Tools, Tool Case, Starter Stickers, Owner's Manual and our free extended warranty.